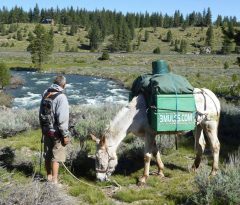 The Mules were walking down a dusty road on a hot summer’s day in Mendocino County when a lady named Mary and her husband came upon us in their automobile, stopped and inquired as to where we were going. We said Covelo. She said where are you from? We said everywhere. Mary then looked around, reached around to the back seat bringing forth a jar of something. She said do you like honey? We said yes. She then handed us a jar of honey. This honey did not look the same as honey we were use to seeing on grocery store shelves. Its color was pale yellow. Later that evening, we found out that it would not run from the jar in 90F degree weather and it was stiff as a board. We then decided to taste this unusual jar of honey so we did and found it to have a most unique flavor and texture never before experienced during our 70 years off again on again casual consumption of honey with such a unique delectable taste. After about a week to ten days of consuming Mary’s honey and finishing the last bit in the jar, the Mules said to themselves what are the chances of ever tasting honey like that again? The Mules said back to themselves “zero”. We are one timers, good things happen just once, the Mules have learned from 70 past years. Don’t try for a second shot you’ll miss. On July 26, 2017, we posted on Facebook about Mary’s honey and said “If you see Mary please tell her the Mules need another jar.” We received several responses and one said that it was Mary Osteen’s honey and that Mary is at the Covelo farmers market every Friday. Well, after about 3/4 weeks, the Mules got a message on Facebook from a lady named Dolores and she said she knew of this notorious lady in Covelo named Mary who sold this delicious unusual honey that would not leave the jar when turned upside down. She knew how to acquire yet another jar of Mary’s honey for us the Mules. The Mules said great. Dolores said she’ll send it on a fast track. We said we travel a slow track. She said okay slow track. Where? The Mules pondered some then requested that Dolores send this now mysterious jar of honey that won’t leave the jar to a lady named Patricia, who is another friend of the Mules and lives in Norco, CA, a place like Mary’s honey with its own uniqueness where human beings practice and know the extreme value of this ages old sacred relationship between Man, Horse and Earth. Thus the Mules thank Dolores for sending the Mules another jar of this delectable honey. We also thank Patricia and Mark with us in this picture for being so helpful to the Mules by giving us a place in Norco for a few days to catch up with mail.